California art - California style watercolor art and American impressionist art. Millard Sheets biography provided courtesy of �California Watercolors 1850-1970� By Gordon T. McClelland and Jay T. Last. Member: National Academy of Design, New York Water Color Club, American Watercolor Society, California Water Color Society. Millard Sheets was a native California artist and grew up in the Pomona Valley near Los Angeles. He attended the Chouinard Art Institute and studied with F. Tolles Chamberlin and Clarence Hinkle. While still a teenager, Millard's watercolors were accepted for exhibition in the annual California Water Color Society shows and by nineteen years of age, he was elected into membership. At twenty, even before he graduated from Chouinard, they hired him to teach watercolor painting while completing other aspects of his art education. By the early 1930s, Millard Sheets was well on his way to national recognition as a prominent American artist. He was exhibiting works in Paris, New York, Pittsburgh, Chicago, Houston, St. Louis, San Antonio, San Francisco, Washington, D.C., Baltimore and many other cities throughout the United States. At home in Los Angeles, he was recognized as the leading figure and driving force behind the California Style watercolor movement. Between 1935 and 1941, the recognition, awards, and his output of high quality art increased. He was mentioned in numerous issues of Art Digest, had a color reproduction in the book Eyes on America, and in 1935 at age twenty eight, he was the subject of a book published in Los Angeles. 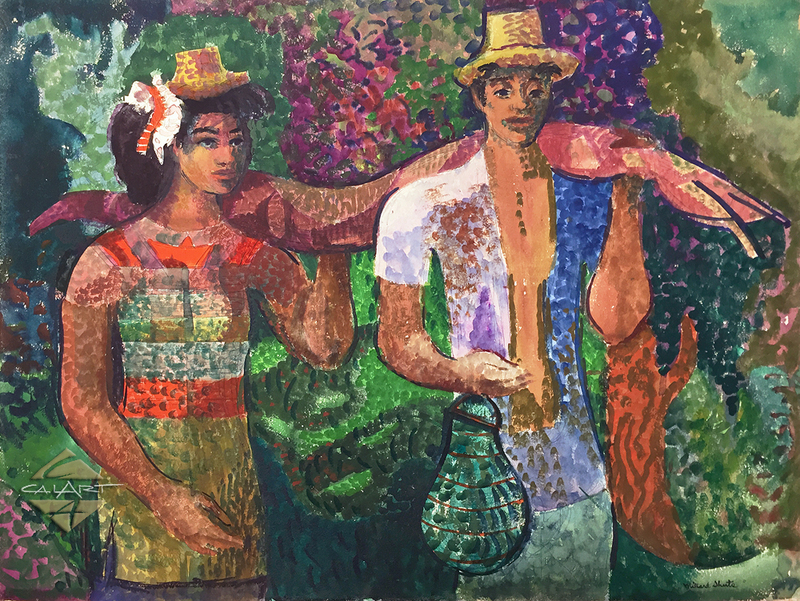 Sales of art enabled him to travel to Europe, Central America and Hawaii, where he painted on location. Although his watercolor painting techniques during this period varied from very tight to very loose, his personal style always came through. Stary-Sheets Fine Art Galleries, Laguna Beach, 1998. 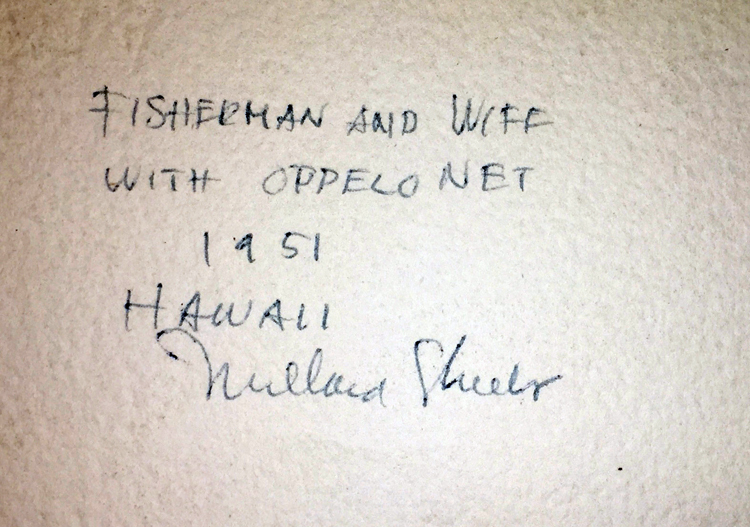 Stunning 1951 full sheet MILLARD SHEETS watercolor titled "Fisherman and Wife with Oppelo Net - 1951 - Hawaii". Painting is signed lower right and signed, dated/titled on back in artists hand. Excellent original condition. Comes directly from family of original owner who was a friend of Sheets.